Hall of Famers: Yankees: Joe Torre (mgr). The 1998 World Series, the 94th edition of Major League Baseball's championship series, matched the New York Yankees of the American League and the San Diego Padres of the National League. The Yankees swept the Series in four games to capture their second World Series championship in three years and their 24th overall. It was San Diego's second World Series appearance and their first since 1984, when they lost to the Detroit Tigers. This was officially the first World Series that Bud Selig presided as Commissioner of Baseball, although he had presided over the Commissioner's Trophy presentation at the end of the 1995 and 1997 World Series. For the first time, the same city—San Diego—hosted both the final World Series game and the Super Bowl the same year; not only were they held in the same city, they were both also held in the same stadium—Qualcomm Stadium. This was the first year this particular World Series logo was used. It was only used again in the 1999 World Series. The 1998, 1999, and 2000 World Series were all won by the Yankees. In Game 1, Kevin Brown took the hill for the Padres while the Yankees sent ALCS MVP David Wells to start. The Yankees began the scoring in the second inning, when rookie Ricky Ledee laced a two-run double into the right field corner with the bases loaded. However, the Padres battered Wells hard, beginning in the third inning when Greg Vaughn homered to right-center with a man aboard tying the game up at two runs apiece. In the fifth, Tony Gwynn smashed a two-run shot off the facing of the upper deck, followed up immediately by Vaughn's second dinger of the night. Trailing 5–2, the Yanks made a comeback in the seventh. Jorge Posada singled and Ledee walked, ending the night for Brown; it turned out to be a bad move by Padres manager Bruce Bochy. New York took advantage of the Padres bullpen with a three-run homer by Chuck Knoblauch that tied the game at five. Later in the inning, with the bases loaded, a 2–2 count call by home plate umpire Rich Garcia would prove to be decisive. Mark Langston's pitch was shown to be borderline and Garcia called it a ball. On the next pitch, Tino Martinez sent a grand slam into the upper deck, giving the Yankees a 9–5 lead. The Padres would score one more run, but the Yankees won Game 1 9–6. In Game 2, the Bombers would go up 2–0 in the Series thanks to a dreadful outing by San Diego starter Andy Ashby. Catcher Greg Meyers, starting for the first time in a month, was also ineffective. Bernie Williams and Jorge Posada would go yard to assist the Yankees on offense. New York started Cuban import Orlando Hernández, who was outstanding. The Yankees sent David Cone to the mound to face former Yankee pitcher Sterling Hitchcock, the MVP of the NLCS. Both teams were kept off the scoreboard until the bottom of the sixth when Hitchcock himself led off the inning with a single off Cone. He and Qulivio Veras both scored two batters later when Tony Gwynn shot a single down the line past Tino Martinez at first base and Paul O'Neill committed a throwing error on the same play. Gwynn would also score in the inning to give San Diego a 3–0 lead. However, a half inning later the Yanks jumped on Hitchcock for two runs, beginning with a home run to left-center by Scott Brosius. The second run came in after Shane Spencer doubled and scored on an error by Ken Caminiti. In the eighth, the call was made to Trevor Hoffman after Randy Myers walked O'Neill to open the inning. Hoffman then walked Tino Martinez before Scott Brosius tagged a three-run blast over the fence in dead center. A Greg Vaughn sacrifice fly, scoring Quilvio Veras, cut the lead to 5–4 coming into the ninth, but the Yankees wrapped up the victory when Mariano Rivera picked up the save to end it. There was some criticism of Padres manager Bruce Bochy for using John Vander Wal as a pinch runner, leaving the responsibility of facing Rivera for the final at bat to Andy Sheets. Sheets struck out to end the game. Andy Pettitte, who struggled throughout the regular season and had turned in a poor start in the ALCS, outdueled Kevin Brown in Game 4, throwing 7 1⁄3 shutout innings. With the Yankees clinging to a 3–0 lead in the eighth, the Padres were able to get two batters on base against Yankees reliever Jeff Nelson; then with the count 2-0 to Ken Caminiti, the Yankees called upon Mariano Rivera. After Caminiti reached with a single to load the bases, Rivera was able to get Jim Leyritz, known for his clutch postseason home runs, to fly out to end the threat. Rivera pitched a scoreless ninth inning to end the Series. 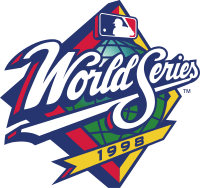 The television rights for the 1998 World Series went to Fox, as they had the rights to the World Series in even-numbered years under the television contract that was signed in 1996. Joe Buck once again provided the play-by-play, with Tim McCarver and Bob Brenly alongside him in the booth. For the first time, ESPN Radio was the home of the World Series, having taken the national radio rights for Major League Baseball from CBS Radio. Jon Miller and Joe Morgan provided the coverage for the network. The series win brought the Yankees' franchise championship total to 24, tying the Montreal Canadiens for most championships won by a North American professional sports franchise. The 1998 Yankees are considered to be one of the top teams in baseball history. With the win, the Yankees posted an MLB record with the most overall wins in a single season in MLB history with 125 wins (including the postseason). The previous record for most overall wins in one season was 118, set by the 1906 Chicago Cubs followed by 116, set by their cross-town rivals, the 1986 New York Mets. The sweep marked the first time the Yankees swept a World Series since 1950 when they swept the Philadelphia Phillies. They were also the first team to sweep a World Series since the Cincinnati Reds in 1990. This was also the first time since 1989 that a team had won a World Series after having the best record in the regular season. It was also the first time since 1986 that a team won a World Series after posting at least 100 wins in the regular season. It was also the only World Series championship during the Yankees' 1990s dynasty not to be won against either the Mets or the Atlanta Braves. The loss made the Padres the first expansion team to lose two World Series, having lost in 1984 to the Detroit Tigers. In addition, the Padres became the first expansion team to lose a World Series at home. As of 2012 the Padres are one of only two teams in Major League Baseball to win at least two league championships and never win the World Series (the other team being the Texas Rangers). Bruce Bochy is the only Padres player or manager to be on every Padres playoff team. Bruce Bochy however would go on to win three World Series titles as manager of the San Francisco Giants in 2010, 2012 and 2014. As of 2015, this remains as the most recent championship game or series a professional San Diego sports team has participated in. The Padres’ loss was also significant as it also assured that the city of San Diego's sporting championship drought since 1963 would continue, which has become the longest streak of such futility for a city with at least two professional sports teams. The Padres left Qualcomm Stadium for Petco Park for the 2004 baseball season. On October 11, 2005, A&E Home Video released The New York Yankees Fall Classic Collectors Edition (1996–2001) DVD set. Game 3 of the 1998 World Series is included in the set. ↑ "1998 World Series Game 1 - San Diego Padres vs. New York Yankees". Retrosheet. Retrieved September 13, 2009. ↑ "1998 World Series Game 2 - San Diego Padres vs. New York Yankees". Retrosheet. Retrieved September 13, 2009. ↑ "1998 World Series Game 3 - New York Yankees vs. San Diego Padres". Retrosheet. Retrieved September 13, 2009. ↑ "1998 World Series Game 4 - New York Yankees vs. San Diego Padres". Retrosheet. Retrieved September 13, 2009. ↑ Durso, Joseph (October 28, 1986). "Mets Get the Magic Back, Take 7th Game and Series". New York Times. p. A1. 1 2 3 Edes, Gordon (October 22, 1998). "World-beaters Yankees finish Padres off, take place in history". Boston Globe. p. E1. With their 125th win of 1998, they became the first team to sweep a World Series since the 1990 Cincinnati Reds, who dispatched the Oakland A's of McGwire and Jose Canseco, and the first Yankee team to sweep since the 1950 club of aging Joe DiMaggio and rookie Whitey Ford bounced the Whiz Kids of Philadelphia. ↑ Scott, Laurence (November 1, 2010). "Giants Bring World Series Championship to West Coast". NBCBayArea.com. Retrieved November 2, 2010. ↑ "Are San Diego Sports Teams Cursed?". San Diego 6. Archived from the original on July 16, 2011. Retrieved 2010-07-01. Forman, Sean L. "1998 World Series". Baseball-Reference.com - Major League Statistics and Information. Archived from the original on December 12, 2007. Retrieved December 9, 2007. History of the World Series - 1998 at The SportingNews. Archived from the original on 2008.